Book hotel rooms online with us at Grande Real Santa Eulalia Hotel Resort & Spa at the lowest rate, guaranteed. 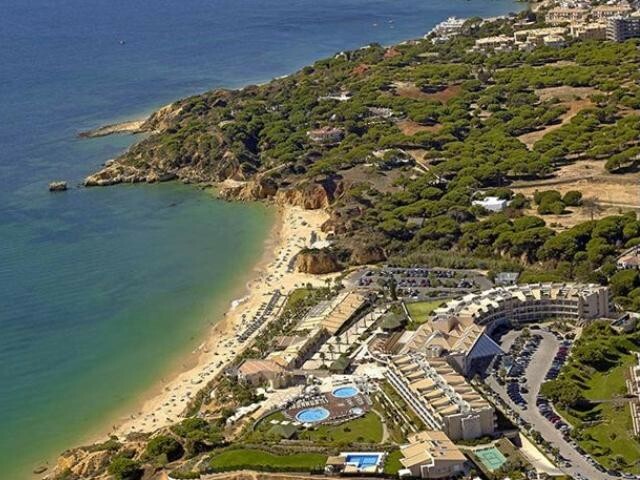 Get a holiday discount room or apartment rate at the luxury 5 Star Grande Real Santa Eulalia Hotel Resort & Spa with direct access to the beach on the east side of Albufeira at Praia da Eulalia in the Algarve. The Resort offers 344 air-conditioned rooms for 2 persons and one-bedroom family apartment for 2 adults and two children. Each hotel bedroom and apartment has balconies with either an ocean or garden views. The spacious 1.000mts2 Real Spa offers an indoor pool, various treatments, massage, plus sauna and steam bath, and there is also a Fitness Centre. Grande Real Santa Eulalia Hotel Resort & Spa in the Algarve provides three outdoor pools, a playground and a tennis court. The hotel restaurant is the Pergula which serves a Mediterranean cuisine. There is a Kids Club throughout the year and Wi-Fi is available upon request. Free private parking is provided on site. On the beach is a popular DJ night club with a restaurant which may be used by hotel guests. A courtesy bus is available for guest to the centre of old town Albufeira.